Dhaka Int’l Textile and Garment Machinery Exhibition is the largest gatherings for the textiles and garments manufacturers in Bangladesh. With 850 exhibiting companies taking up more than 1050 booths showcasing state of the art machineries and technologies, attracting more than 30,830 international and local visitors. 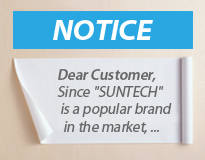 SUNTECH as the leading designers & manufacturers on Textile Machinery, especially Fabric Make-up Machines and Material Storage & Handling Equipments, has built very good market fame in Bangladesh. Our flagship products: Automatic Fabric Roll Wrapping Machine and Computerized Beam Storage System attract widespread attentions. Obviously, this exhibition brought us another great success!